Pi Beta Phi Graduation Cords can be wine and silver blue, as these are the colors of Pi Beta Phi. Cords of these colors from Honors Graduation are 70 total inches in length. At Honors Graduation the cords that we use for Wine and Silver Blue are Maroon and Royal Blue double tied graduation cord. Our maroon honor cords are very similar in color to wine. Another cord that is close to wine is the rose pink honor cord. Rose pink is lighter in color than maroon. When ordering your Double Graduation Honor Cords you will want to choose maroon for your first color, then select double for the style and royal blue for the second color. 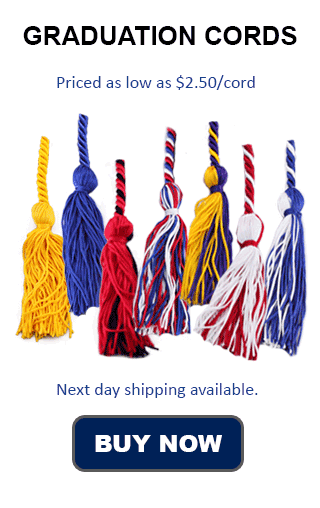 At Honors Graduation you can order as many or as few Maroon and Royal Blue graduation cords as you desire. We have no minimum order size, and a discounted pricing structure for larger orders. Shipping is one flat rate that will get your cords to you in 4-6 days or sooner. Pi Beta Phi has a publication called The Arrow. One of the philanthropies that they contribute to include First Book, which is a non-profit organization that provides new children's books to low income families. Other philanthropic organizations they work with are: Champions Are Readers, Arrow in the Arctic, and Arrowmont. They also partner with Read across America, which is a reading awareness program. One could say that the area of society that Pi Beta Phi likes to contribute to is literacy. Pi Beta Phi is a Fraternity for Women, and was founded over 145 years ago on April 28th 1867 at Monmouth College. Originally it was founded under the name of I.C. Sorosis. Currently the Fraternity is headquartered in Missouri in Town and Country. Another Fraternity for women is Alpha Omicron Pi.